Cambridge was the first day of the tour. We played at the Middle East. The Middle East is normally in the middle of the tour. So it was strange to be playing there feeling fresh and full of energy and not to be in anyway mental. First though we woke up in our bus at a Holiday Inn somewhere in Boston to have showers. We only had one room between the 8 of us and we had only just checked in so we definitely were not allowed to have breakfast from the buffet. We managed to steal it though. We didnt get caught even though we were clearly coming in from the cold in our winter coats rubbing our hands and loudly saying 'brilliant lets steal some cakes'. Perhaps they felt sorry for us. I do look a bit 'homeless' first thing in the morning. After showering and stealing breakfast we headed over to the Middle East to sound check/Eat lots of homus. Then I did a million phone interviews until the doors were opened. I really enjoy doing interviews now that they are all about DC Comics and The Replacements and not so much about erectile dysfunction. The two bands we played with are Tab The Band and Princeton. Princeton are doing the whole tour they are awesome. I liked Tab The Band too. Ian tells me that the type of music they play is called chug rock. There was a rumour going round the gig that someone in Tab The Band was related to a member of Aerosmith. The show was loads of fun. Everyone kept trying to buy us drinks which was lovely although we were doing a pretty good job of getting drunk by ourselves and any outside help was unnecessary and might have tipped us over the edge. Thanks again though to everyone that offered to buy me a shot. 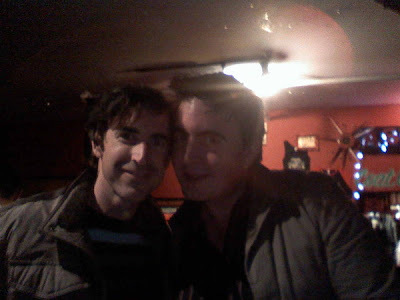 My friend Peter Hughes from The Mountain Goats came down to the show with his brother and his girlfriend. We were discussing the rumour that a member of Tab The Band was related to someone in Aerosmith and how easy that sort of thing is to make up as everyone is afraid to ask the person. Peter was telling me that he reckons the best way to start a rumour about yourself is not to say the lie yourself but to get your friends to spread the lies around for you. After we'd been speaking about that for a bit. Peter told me he wanted to show me something. We went upstairs and he popped his glass eye out. I didnt know he had a glass eye. You'd think it would be on his wikipedia page or something. He is also, it turns out, Madonna's nephew. Dont mention it too him though. He is a bit embarrassed about it. Here is a photo of me and Pete. It is a terrible photo. It looks like he has two glass eyes. He doesnt though. He only has one. "My friend Peter Hughes from The Mountain Goats came down to the show with his Brother and Girlfriend." His brother is his girlfriend? JK, sorry to pick apart your grammar mine is worse than anyone's. Wow, a glass eye. I will tell everyone. You were great at the Middle East and thank you for opening with Road Runner even though I suspect most of the kids there were too young to know who Jonathan Richman is (so sad). There is a real train station called Government Center in Boston by the way, next time you're here I'll take you there if you just ask. I'd let you use my shower too but I think I'll run out of hot water (but not towels) if there's 8 of you. PS will you ever make MODERN ART MAKES ME WANT TO ROCK OUT T-shirts again? I stupidly missed my chance to buy one when I saw you yrs ago. I am still full of deep regrets.